Grow extremely heavy yields of mid-season berries that ripen all at once in late June. You'll be in berry heaven with these sky blue berries that are perfect for canning or freezing. Easy to pick, Bluegold is also delicious when eaten fresh! This compact, 3-5' plant has dark green foliage that turns golden yellow in the fall and is a great addition to any landscape! Plant in soil that has a pH of 4.5-4.8 for best results. Bluegold is self-pollinating but will produce better yields if another variety is planted. Pest and disease resistant. Zones 4-7. Light Requirements Full sun to part shade. 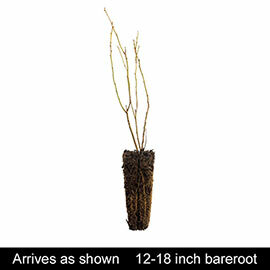 For each offer ordered, get 1 bareroot . Spacing: 3 - 4 ft. Depth: Plant at same depth as it was in the nursery. Firm soil and water thoroughly. Sun/Shade: Full sun to part shade. Foliage: Dark green foliage that turns into a glorious golden yellow in fall. Soil Requirements: Organically rich, medium to wet, well-drained soils. 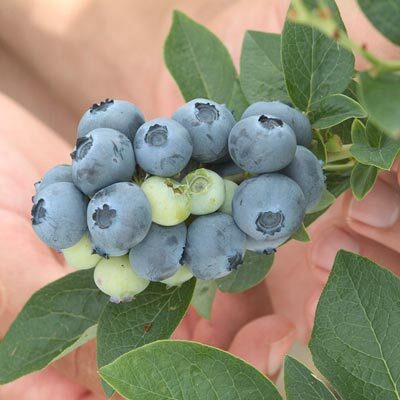 We recommend a soil pH level of 4.5 - 4.8 for blueberry plants. Pruning: Prune out leggy small twigs for better berries. Prune as needed in late winter beginning in the third year after planting. Pollinator: Although blueberries are self-fertile, cross-pollination produces the best fruit crop (larger berries and larger yields). Therefore, it is best to plant more than one variety that will bloom at the same time.